The word charoset comes from the Hebrew word cheres which means clay. 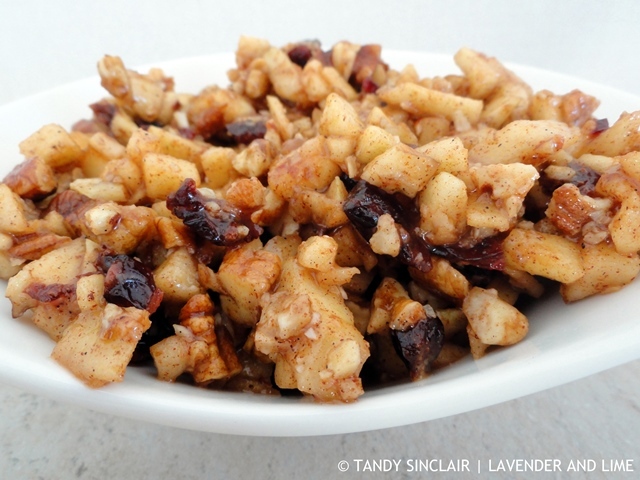 Charoset is a mixture of chopped nuts, apples, spices and wine that is presented on the Seder plate for Pesach, the Jewish celebration of Passover. It represents the mortar that the Jewish slaves used to make the bricks for the pyramids. Another item on the Sedar plate is bitter herbs. Usually freshly grated horseradish (if available). This symbolises the bitterness of slavery. If horseradish is not available, a bitter green lettuce, such as romain, can be substituted in its place. The Hebrew term for the bitter herbs is maror and they are dipped into the charoset to lessen their bitterness. I have written out the last review of a recipe book by hand! This is an amazing time saver for me. I used to take the book I was reviewing and page through it with a notepad close by. I would then write up what I wanted to say in the post using my own made up shorthand. This quick writing skill was a necessity at University and even though it does not make sense to anyone else, it makes perfect sense to me. When I got my iPad the first App that I downloaded was SwiftKey. This enables me to run my fingers over the keyboard to take my notes. According to the statistics provided to me I am 45% more productive ‘typing’ this way. SwiftKey has saved me 7448 taps of the keyboard and I have travelled 1 346.64m across the screen. I still need to get used to looking at the words predicted but all in all I am super impressed with the time I am saving using this App. Do you use an app that saves you time? Having spent quite a few Pesach’s with my Jewish friends over the years, I have always seen charoset on the sedar plate, but have never actually tasted it. Looks great. Wow what an interesting and delicious looking dish! I don’t have an ap that I regularly use, but I have a system of consisting of an ever-present computer at my fingertips and a combination of google-docs that I’ve put together to “organize” myself. Such an interesting history for this dish, Tandy. I’m sure it’s very tasty indeed. Wow, this looks so amazing. I would like to try it immediately. Thanks for sharing. I have also not heard of charoset before but wow wouldn’t this even be amazing baked inside a phyllo dough or just straight out of the bowl. Wishing you a super weekend! It is amazing when baked! I’ve never had charoset but it sure looks and sounds like something I would totally love. Digging the app too, I have a bunch of apps that are meant to assist with time keeping, making my life better, quicker, more productive, but I seem to not get around to using them. Oops! Hi Tandy, lovely to met you. I have to join the others in saying I’ve never heard of this before. It look really tasty and even better that it’s easy to make! I remember learning about charoset and the Seder plate back in college, but haven’t had the opportunity to taste it. It sounds delicious; love the addition of the dried cranberries. Thank you for sharing this recipe. It is a really important cultural recipe – I love how food and culture and intertwined. Thanks also for sharing re Swiftkey. I am so going to check that out. What a great looking dish and very intriguing!!! Don’t use any particular time saving app, but do keep track of how I’m spending my time. I have no idea where my time goes! I have never heard of charoset or Swift Key so this was a really interesting post Tandy! 😀 I wish I could both write and type faster! Looks so delicious. I grew up eating my mom’s apple pie. Like this healthier version. You would love this in a pie! Hi Tandy, very interesting did not know what the word charoset really meant. Great post. The app that I use to save time is notepad, this will copy and paste very nicely when I blog. I barely use apps that save me time unless it’s my calendar… but I will definitely have to make this snack for my mom. She would love it. I recall as teenagers at our very hippy Catholic school that we learned about Passover. When I say very hippy, there were no uniforms, only 1 nun, no priests and we only went to mass a couple of times a year. They taught us about Islam, Judaism, Buddhism – very open minded for the times. Anyway, the reason I’m telling you this is that I recall the story of the bitter herbs, honey (charoset) and flat bread and wandering in the wilderness. They replicated the meal and in those days, the closest they could find to bitter herbs was parsley. Not very bitter but the best they could do. What a unique and delicious recipe! I’ve never had charoset but it looks and sounds delicious! I’ve never heard of charoset, but this looks delicious! I’ve also never heard of SwiftKey, but it sounds like a great time-saver! It is my favourite app! I have never had or heard about Charoset before, but looking at ingredients you have used here I am dying to make this. Can’t wait to try! Please let me know what you thought of it! I adore apples and pecans together, so this sounds delicious to me.